Fact-finding teams of the Bharatiya Janata Party and the Communist Party of India-Marxist were on Monday denied permission to visit violence-hit Kaliachak in West Bengal’s Malda district by the authorities, triggering a spat with the state's ruling Trinamool Congress, which alleged saffron outfits were trying to ‘communalise’ the situation ahead of the assembly election. A team of BJP members of Parliament which arrived in Malda on Monday morning was turned back from the railway station itself, drawing a sharp attack from the party which accused Chief Minister Mamata Banerjee of playing ‘vote bank’ politics and said it will take the matter to the President. The party said it would request Union Home Minister Rajnath Singh to order a high-level probe into the prevailing situation in the area. Hours later, a CPI-M team headed by MP and politburo member Mohammed Salim was also prevented from reaching Kaliachak. A fact-finding team of BJP MPs Bhupendra Yadav, Ram Vilas Vedanti and S S Ahluwalia, an MP from the state, was turned back by the district authorities soon after they alighted from the Gaur Express at MaldaTown station at 6 am, citing prohibitory orders. Yadav claimed they were forced to return by Howrah-bound Shatabdi Express. "This act of the West Bengal government is condemnable," Yadav said. 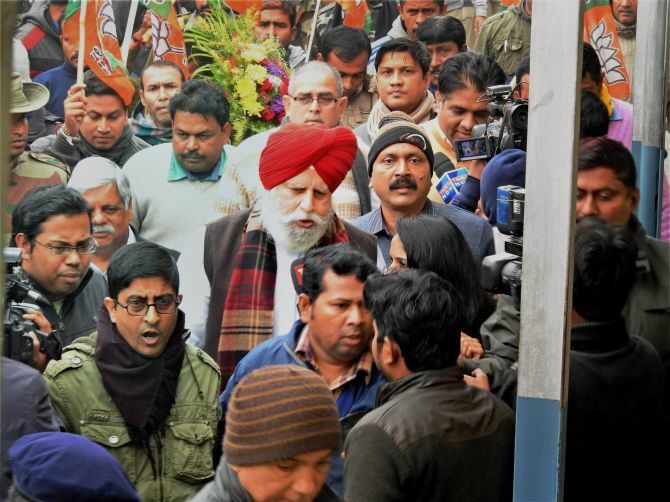 Ahluwalia said the team will request Union Home Minister Rajnath Singh to constitute a high-power committee to go into the situation in the area. "The purpose of the visit was to console the people, to restore their confidence that something like this will not happen in future. Due to pressure from the state government, the district administration said that we cannot go there as Section 144 of the Criminal Procedure Code has been imposed,” Ahluwalia said. Reacting to the development, senior BJP leader Siddharth Nath Singh said in Delhi that a party delegation will meet the President in this regard. The decision not to let the three-member BJP team go there was a 'text book example' of Banerjee's vote bank politics, Singh, a BJP national secretary, alleged, adding the 'dictatorial state government has compassion for criminals but it shows tamncha (gun) to nationalists'. CPI-M leader Mohammed Salim said his team was turned back by the authorities citing ‘law and order issues’. "I, along with my party leaders, was going to Kaliachak. It was planned, but all of a sudden a huge police contingent stopped us near Amriti area of Malda, 35 km from Kaliachak. I told them that being an MP it is my duty to find the facts and talk to the people. But, they said they can’t allow me," Salim said. "I want to ask the administration what are they trying to hide that they are stopping all other political parties (from going to Kaliachak)?" he said. West Bengal's ruling TMC mounted a swift counteroffensive, charging the BJP with 'whipping up communalism' ahead of the state assembly election. "The situation in Kaliachak, Malda was tense, but never got out of hand. The police handled the issue tactfully. Thankfully, no deaths occurred, no injuries and 10 people have been arrested," TMC chief national spokesperson Derek O’Brien said in a statement in Kolkata. Dubbing Kaliachak violence as a 'criminal issue', he alleged, "The BJP and the Rashtriya Swayamsevak Sangh, as is their strategy, tried to turn it into communal issue. They did this by trending hashtags on Twitter, sharing year-old photographs and posting irresponsible tweets with the help of its social media army." O'Brien said that the BJP was trying for the last one week to present ‘what I call CIN 100, Communally Insensitive Narrative, 100 days before the state goes to polls. They follow the same tactic in all election-bound states’. Addressing the media in Delhi, Siddharth Nath Singh, rejected the Mamata Banerjee government’s explanation for the violence that it occurred on account of some issues between the BSF and the locals in Malda district on January 3. He claimed the purpose behind it was to destroy the records allegedly related to a fake currency racket kept in a police station. "We will meet the home minister to seek an appropriate enquiry and also meet the President due to the seriousness of the situation," Singh said. A rampaging crowd had set on fire Kaliachak police station and several vehicles while reportedly protesting against the alleged blasphemous remarks made by a pro-Hindutva leader. Singh, who is also party’s co-incharge of the poll-bound state, said the protest was held more than a month after those ‘condemnable’ remarks were made, claiming it was not a ‘spontaneous event but planned action’.